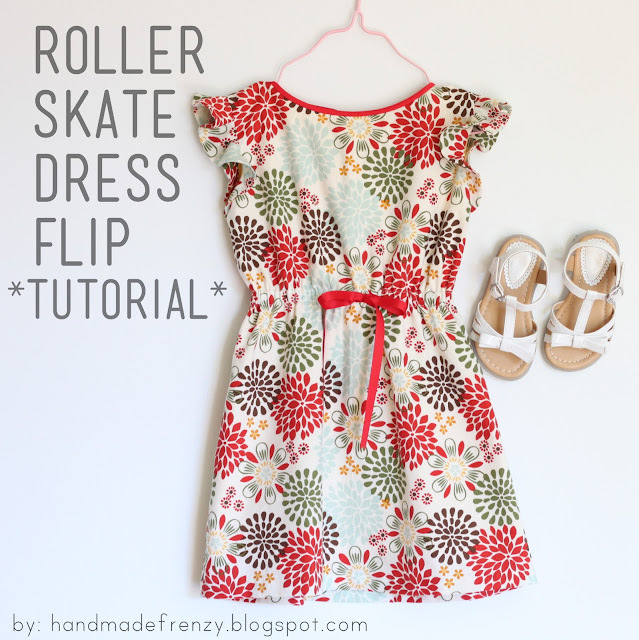 Last week I showed you the Roller Skate Dress "flip" I did for the Flip This Pattern series over at Frances Suzanne. The winners were announced and while I didn't win the judge's choice I was named one of Father's Fantastic Five! WOOO! 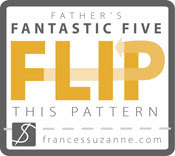 Today I'm going to give you a step-by-step tutorial on the changes I made to the pattern to flip it! Just to re-cap, I added bias trip to the neckline, eliminated the faux cap sleeve and added flutter sleeves, and I lowered the waistband to hit at the natural waist rather than an empire waist. I also added 1 1/2 inches to the length. To add the length, I used my clear ruler to follow the curve of the pattern, moving it along the edge, making small marks as I went. At the sides, I lined up the ruler with the angle of the skirt and continued the line down to my new hemline. To create a new armhole, rather than cut the faux cap sleeve off (I want to use the pattern as is in the future), I drew the new curve on the pattern and then used a pin to poke a small hole approximately every inch. Then, I used my pen to make a mark on the fabric at every pin hole. Connect the dots on your fabric. Everyone has their own way of cutting out a pattern. The method I prefer to use is to simply trace the pattern onto my fabric before cutting. It's easier and quicker for me than to try to pin the pattern to the fabric or to try to avoid shifting the pattern while cutting around it using pattern weights. After cutting out the dress, I cut out my flutter sleeves. I used the Geranium Dress flutter sleeve pattern in the larger size. I wanted lots of flutter and also wanted it to be a lined sleeve so I used the larger size and cut four pieces (2 for each sleeve). To lower the waistline, place the pattern 2 1/2 inches down from the neckline, try to keep things as even as possible. Using the same method as for the arm hole, transfer the the waistline markings. I used a disappearing ink pen for the dots. Next sew your sleeves, right sides together on the outside (larger side) of the sleeve, using a 1/4 inch seam allowance. Trim the seam allowance to 1/8 inch. I chose to use a pinking shears for this step. Turn the sleeve right sides out and iron the seam flat. Place a pin 4 inches from each end. Sew a basting stitch between the two pins. Now fold the sleeve in half and find the center, pin the center to the shoulder seam. Gather the sleeve slightly on one side of the pin and then the other, concentrating the gathers towards the center. Pin the entire sleeve in place. Sew with a 1/4 inch seam allowance. I left about an inch of the sleeve off, just personal preference. Next sew the outer fabric to the lining at the neck per pattern instruction, but do NOT sew down the back. Trim seam allowance to approximately 1/8" - 1/4". Turn right side out and press the seam. Now for the bias trim. I used 1/4" bias trim. Notice how one side is slightly shorter than the other. Open the bias trim up all the way and pin right sides together (creases are the wrong side), make sure to match up the SHORTER side to the neck edge. Sew along the first crease. Now flip the bias tape over the neckline, enclosing it. Pin in place. Now you will stitch in the ditch. Go slowly and make sure your needle falls in the seam right between the bias tape and the outer fabric. This is what it will look like on the outside, almost invisible! And this is on the inside, by stitching in the ditch you will also ensure that you catch the tape on the wrong side. If any spots are missed, resew that area or stitch it down by hand. I must have forgotten to take a picture of the next step :( Next you will want to turn the dress inside out again and stitch the back of the dress (where the button closure is) down to the mark as per the pattern instructions. Then for the very last part of the flip, pin the armholes right sides together, making sure to keep the sleeve on the inside and then proceed to finish the pattern as normal. And the flip is complete! You were featured here! Thanks for linking up! love this, found you through pintrest …..gonna give this a try!!!!! This is so cute and the tutorial is perfect to apply to a multitude of patterns! Thanks so much! So happy you like it!! You're welcome! This is just the cutest dress ever! It makes me want to sew a dress! Merci!!! un très beau tutoriel!